WELCOME to CHOCOLATE COVERED FEBRUARY! For the next 14 days, you will seem projects that are made to "pretty up your chocolates" - whether they are homemade or store packaged! Give the gift that puts smiles on faces! 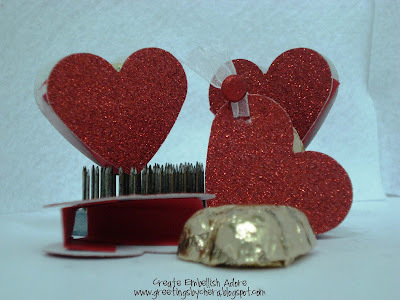 Today, I have Glitter hearts... ladies/Gent- this is super easy, fast and fun! If either of my teens wanted treats for friends, this one would rank pretty high on the list. Large heart punch (2) and 1 3/8 square punch (2) plus your chocolate and WAHA LA - you have a treat holder! I used the SU! Glitter paper in my heart punch, and Real Red CS. Depending on your chocolates would depend on your score lines... I used Reese Hearts, and had to score my 1 3/8 square at 3/8 & 5/8 but you might have to play around with it. 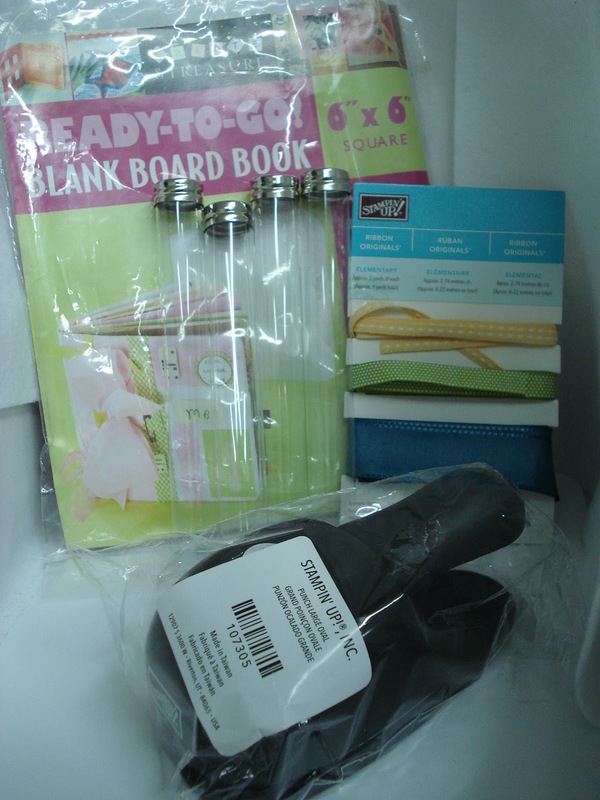 LEAVE COMMENTS THROUGHOUT THIS 14 DAY EVENT AND YOUR NAME WILL BE ENTERED TO WIN THIS!!!! And to be filled with chocolate what more can a girl ask for. What a lovely idea! I'll certainly visit each day. Great heart holder. Thanks for sharing. cute. Like the idea of these a lot. Thanks for sharing. These look super cute and easy to do. I love chocolate so I'll have to come back ans see what else you have in store! Thanks! I played with some of this paper over the weekend. It will be included in my next order. Love the little treat boxes. Love the glitter paper - and chocolate too! glitter and chocolate...the way to this crafty girls heart..love your project. Great little box, I think these would make great 'banquet' favors too! Well, Chera, you're a woman after my own heart when you start talking bout 14 days of CHOCOLATE! Since I'm from Texas I think everything is bigger, but 14 days will work just fine. 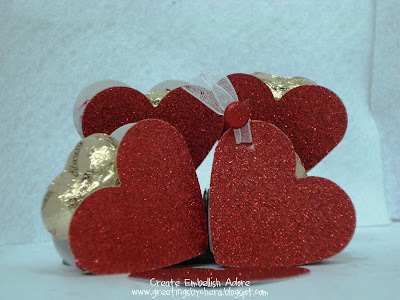 I love this heart box and have been searching on how to make it. Now I know. I'll be watching and see if you come up with anything that would make me want to "share" some of my chocolate.Thank you for making it fun. Love it!!!! Hope that Stampin'Up! comes out with more glitter colors. Would these heart treats not be great at a Relay for Life in Pink? Can't wait for more ideas from you. such a cute idea! and we have a valentine party next week! Punches make crafting so much. Love the chocolate idea. I will be hosting my first workshop next week and i think i will make these as favors. Thanks! These are great. I love the Glitter paper!!! Love, love love the glitter hearts!!! withhhhhhh CHOCOLATE!! very nice!!! I've checked out your blog, and will be following, your work is lovely! Thanks for sharing! Loving those glitter heart treat holders! I'll have to give this a try. Thanks for sharing. WOW! Love the glitter but very easy to reproduce for big classrooms...TFS! try god 20 at verizon dot net I would love to subscribe to your blog but need some assistance.